Трэцяя міжнародная навукова-практычная канферэнцыя - 9 снежня 2017 г.
Час правядзення: 9 снежня 2017 г.
Месца правядзення: Мінская багаслоўская семінарыя Саюза ЕХБ у РБ. Мінск, вул. Я. Райніса, 6. 2. Францыск Скарына (1490 1551) і выданне беларускай Бібліі. 3. Рэфармацыя ў Беларусі ў кантэксце еўрапейскіх рэфармацыйных працэсаў. Заяўкі і тэксты дакладаў на ўдзел у канферэнцыі прымаюцца да 1 лістапада 2017 г. па адрасе аргкамітэту: Мінск, вул. Я. Райніса, 6. Кант. тэл. : (+375 17) 285-47-40. Павел Асененка, е-mail: . Venue: Minsk Theological Baptist seminary in Minsk, 6 Rainisa str. 1. History of the Evangelical church in Belarus in 15-21 cc. 2. 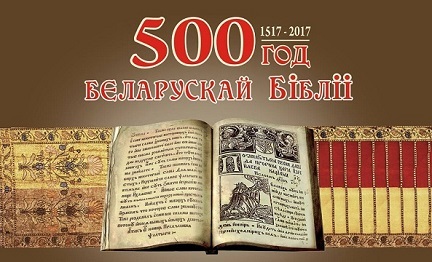 Francysk Skaryna (1490 1551) and the publishing of the Belarusian Bible. 3. Reformation in Belarus within the framework of the European Reformation. 5. Belarusian Bible translations and Bible studies in Belarus. 6. Modern Evangelical movement in Belarus: tendencies and prospects. Participation applications and papers to be read are accepted until 1 November 2017 by the organizing committee at: Minsk, 6 Rainisa str. Phone: (+375 17) 285-47-40. Pavel Asenenka, е-mail: . Working languages: Belarusian, Russian (organizers provide translation from English and Polish). Publishing language for the conference materials: Belarusian. Text format requirements: an article up to 40,000 symbols should be thoroughly edited. Line interval is 1. Margins – 25 mm. Script: Times New Roman; 14 pt. TO BE GIVEN: 1/ author’s name and last name; 2/ paper title; 3/ references on each page in accordance with the accepted Belarusian standards (e.g., author, book/document title, publishing house, year, page, etc.). Organizational committee has the right to select applications for the conference participation and paper texts to be published. Expenses connected with the conference participation are to be covered by the participant/ his (her) employer. 1. First name, last name (patronymic name if relevant). 3. Academic degree and rank. 4. Report/ paper title (and necessary equipment, e.g., projection device, etc.). 5. Work or home address, contact phone (with code), e-mail.